Karaoke is fun for some. For many, though, even with booze involved, it tends to be an exercise in fear and awkwardness. So hopefully this new card game can help. 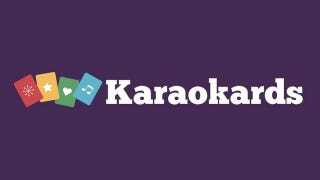 So when you support Karaokards you're getting two different games: Karaokards Classic to play during karaoke — at home, on a night out or wherever and however you choose — and Karaokards Columns to play with friends around a table (which can also involve drunken singing, but doesn't have to). The key here is that, unlike pretty much any other karaoke experience (but especially singing games), there's no competition. No pressure. It's using the systems of a card game to ease you into singing out loud, where normally you might feel too embarrassed to try. It's currently up on Kickstarter, and is only asking for £5,900.